Beachfront Inn . . .Yes - on the beach! All rooms have private bath, microwave, refrig, table with two chairs. The updates keep coming and Beachfront is still able to keep their rates affordable for travelers to the Door Peninsula. 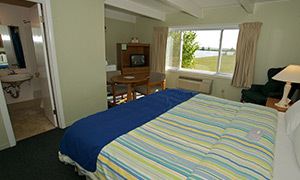 Beachfront Inn is the name for the former Sunrise Motel and the Inn at Baileys Harbor. The new owners in 2018, Shana and Oscar (he's a Shih Tzu mix dog! ), purchased the place in 2018, and are carrying on the traditions and making improvements. The couple painted dark wooden trim around windows and doors a crisp white. They added new bathroom sinks, toilets, tile and lighting fixtures. There’s also new bedding (with harmonizing green and blue natural prints) and lamps. so this is unique! Read on! So look for an inviting cream-colored hotel, as the green paint from the past is totally gone. Tammy or Terry will personally greet you (with their adorable friendly Springer spaniel, Max) in the office for check-in. 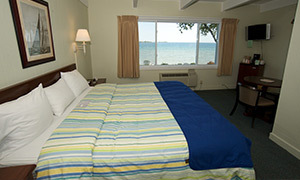 Beachfront Inn has about 20 rooms, on the lakefront and sideview rooms. Tammy told me in 2012 they added all new down comforters to all the rooms - even the dog friendly ones! Three rooms have sofa sleepers, as well. We admired the gorgeous water view and the Bird Cage Lighthouse from a second floor lakeside room. “And when the ships go by, it is just beautiful,” Tammy adds. 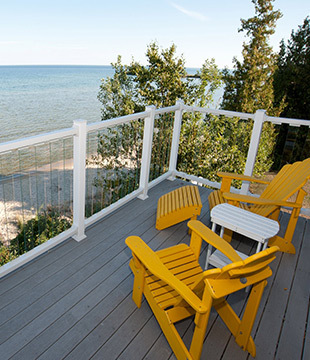 You are really close to Lake Michigan here as the inn sits just 60 feet back from the water. See and hear the waves roll in on the inn’s very own beach. You can enjoy the outdoors from a large deck and patio accessible from the office. There’s a grassy area, too, where you can sit at one of the provided picnic tables and enjoy lunch or dinner. And there’s the heated outdoor pool and deck with various depths to accomodate all. “At night, we get campfires going. We supply everything needed for s’mores, and they can sit and hang out. People just love it,” Tammy says. So hit the beach at night too! There is parking just outside your room at the buildings. All rooms include private bath, a microwave, refrigerator and a table with two chairs. If you like some snacks for keeping in that refrigerator, all you need to do is walk to the office. The Borks sell cheese from Star Dairy in Weyauwega, Wis. That’s where they lived before moving to the Door Peninsula and starting their own business. “We’ve been coming here for 20 years, and it has been a dream to move here. We wanted to stay in Door County,” Tammy says. So after coming here so long, the Borks know all the good places to go. They maintain copies of restaurant menus in the office and are full of tips—just tell them what you like and your budget. Tammy likes to chat about the nearby Ridges Sanctuary in Baileys Harbor, a natural preserve, saved from a trailer park developer in 1937, and home to 25 native orchids and rare plants. But a lot of people just like spending time outside their room or taking a walk on a nearby pier at Beachfront Inn, where the owners often partake in cocktails with their guests. Oh, and don’t forget to tell Shana and Oscar that DoorCountyNavigator.com sent you and to check out the old red gas pump in front of the office. The price posted is a site to behold--32 cents per gallon! “We had it redone. Everyone says they are going to fill up before they leave,” the old owner told us. So check out the Beachfront Inn– there are so few places to stay this close to the water! We think you will find the place and the hospitality very enjoyable! Please tell them that DoorCountyNavigator.com sent you - that helps keep the site alive & well for you, and be sure to mention their Property ID# 8040!